The posttranscriptional mechanisms by which RNA binding proteins (RBPs) regulate T-cell differentiation and cytokine production in vivo remain unclear. The RBP HuR binds to labile mRNAs, usually leading to increases in mRNA stability and/or translation. Previous work demonstrated that HuR binds to the mRNAs encoding the Th2 transcription factor trans-acting T-cell-specific transcription factor (GATA-3) and Th2 cytokines interleukin (IL)-4 and IL-13, thereby regulating their expression. 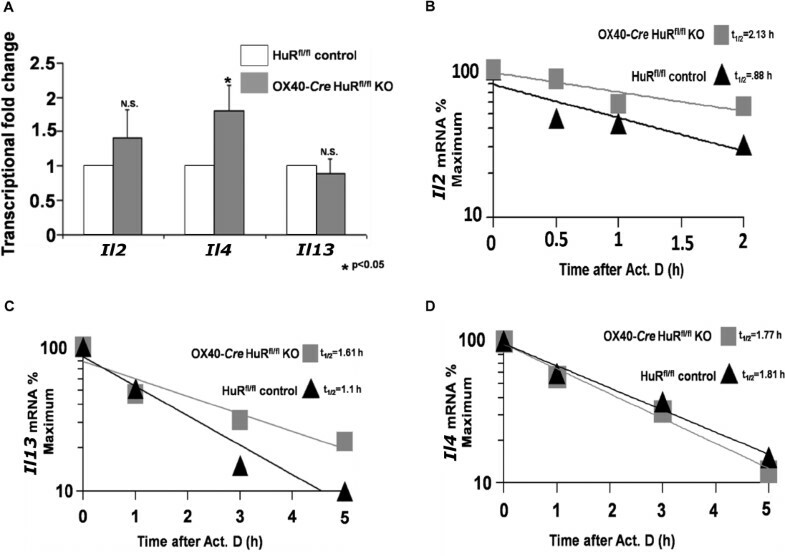 By using a novel conditional HuR knockout (KO) mouse in which HuR is deleted in activated T cells, we show that Th2-polarized cells from heterozygous HuR conditional (OX40-Cre HuRfl/+) KO mice had decreased steady-state levels of Gata3, Il4 and Il13 mRNAs with little changes at the protein level. Surprisingly, Th2-polarized cells from homozygous HuR conditional (OX40-Cre HuRfl/fl) KO mice showed increased Il2, Il4 and Il13 mRNA and protein via different mechanisms. Specifically, Il4 was transcriptionally upregulated in HuR KO T cells, whereas Il2 and Il13 mRNA stabilities increased. 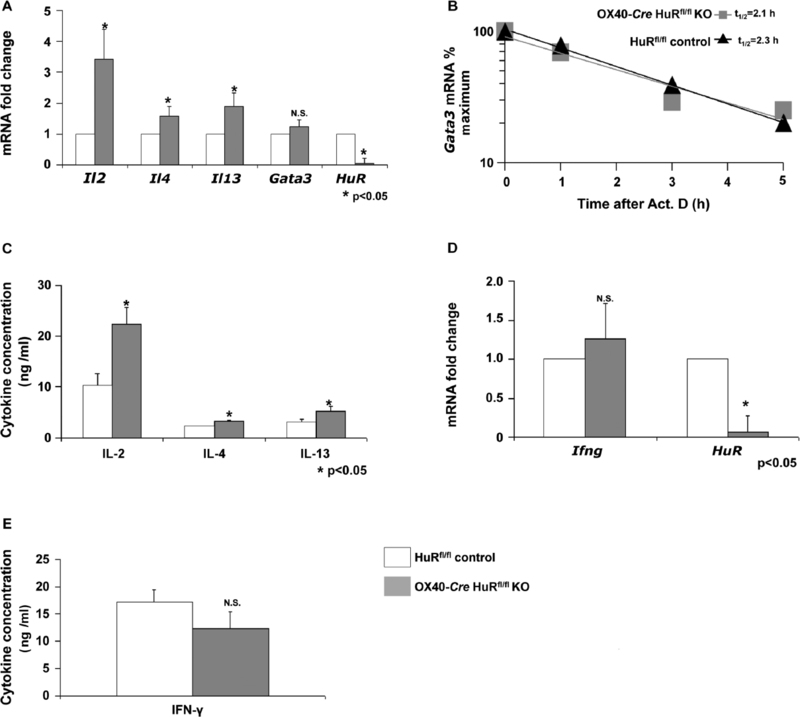 Additionally, when using the standard ovalbumin model of allergic airway inflammation, HuR conditional KO mice mounted a robust inflammatory response similar to mice with wild-type HuR levels. These results reveal a complex differential posttranscriptional regulation of cytokines by HuR in which gene dosage plays an important role. These findings may have significant implications in allergies and asthma, as well as autoimmune diseases and infection. MMG and PT contributed equally to this work. 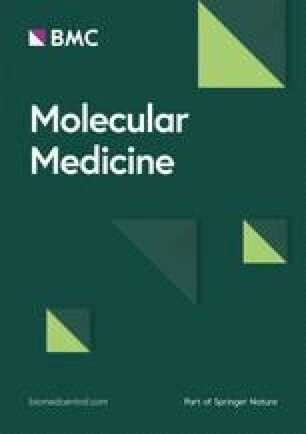 Supplementary material is available for this article at https://doi.org/10.2119/molmed.2013.00127 and is accessible for authorized users. The process of naive T-cell activation and differentiation toward polarized effector T cells tailors specific immunity against pathogens, while allowing tolerance against harmless allergens, commensal organisms or self-antigens in a healthy individual (1). However, certain diseases arise as a direct consequence of aberrant effector T-cell cytokine production or alterations in immune homeostasis (2). Therefore, understanding the mechanisms involved in T-cell differentiation is critical. During T-cell activation, the cell undergoes rapid and dynamic changes with up to 50% of the changes in cell-specific gene expression occurring at the posttranscriptional level (3,4). Studies within the past decade have identified several cis-elements and trans-factors that mediate these processes in T cells (5). Chromatin remodeling and transcriptional activation are highly integrated with posttranscriptional mechanisms, which specifically regulate the rate of mRNA transport, turnover and translation (6,7). Several trans-acting factors regulating these changes have been identified, but the functional mechanisms of their actions are not well understood. Such factors include RNA binding proteins (RBPs), which determine mRNA maturation, localization, stability and translation. mRNAs that possess adenylate and uridylate-rich elements (AREs) or U-rich elements are subject to control by RBPs (8,9). Upon activation, naive CD4+ T cells can differentiate (also known as polarization) in several different lineages, such as Th1, Th2, Th17, Treg and Tfh subsets. Each of these subsets is characterized by relevant signature transcription factors and cytokines. For example, Th1 lineage is characterized by the expression of T-bet transcription factor and production of interferon (IFN)-γ. In contrast, Th2 lineage is characterized by the transcription factor trans-acting T-cell-specific transcription factor (GATA-3) and by IL-4. A fuller discussion of CD4+ T-cell differentiation can be found in the review by Bill Paul and associates (1). Early-response genes including growth factors, signaling molecules and oncogenes frequently contain AREs. Interestingly, 90% of chemokines and cytokines contain AREs, illustrating the importance of posttranscriptional gene regulation during an immune response (10). Within the selective set of RBPs recognizing AREs, HuR has emerged as a key regulatory factor modulating mRNA stability, localization and translation (11). HuR contains three highly conserved recognition motifs, which generally bind to AREs or U-rich elements usually found in the 3′ untranslated region (UTR) of its targets. In resting T cells, HuR is 90% nuclear but is upregulated and translocated to the cytoplasm upon activation (12). In the cytoplasm, HuR can affect mRNA stability and/or translation via interplay with other RBPs, including T-cell intracellular antigen-1 (TIA-1), tristetraprolin (TTP), transcription factor IIIB 90 kDa subunit (BRF1), heterogeneous nuclear ribonucleoprotein D (hnRNPD; AUF1) and KH-type splicing regulatory protein (KSRP), as well as microRNAs (miRNAs) such as let-7 (13, 14, 15, 16, 17, 18). HuR regulates multiple transcripts involved in adaptive immunity including CD247 (CD3ξ), IL-3, IL-6, CD95/Fas, CD40L, cytochrome c oxidase subunit II (COX-2), granulocyte-macrophage colony-stimulating factor (GM-CSF) and tumor necrosis factor (TNF)-α (10,19,20). Additionally, we and others have previously demonstrated that the Th2 master transcription factor GATA-3 and Th2 cytokines IL-4 and IL-13 are positively regulated at the posttranscriptional level by HuR (21, 22, 23). Therefore, we hypothesized that HuR is coordinately regulating Th2 polarization and cytokine secretion, implicating its involvement in Th2-mediated diseases, such as allergic airway inflammation (24,25). Despite recent advances in our understanding of posttranscriptional gene regulation, most of the information currently available has been derived from cell lines. To study disease processes such as allergic airway inflammation, transgenic and knockout mice are needed. A limitation that has arisen in knocking out HuR in all tissues is that this scenario results in embryonic lethality, thus preventing the assessment of its involvement in immune processes and diseases (26). Therefore, we decided to create a novel HuR conditional knockout mouse using the Cre-loxP strategy to knockout HuR in activated T cells. Previous studies using the Cre-loxP system deleting HuR early in thymocyte development during the double-negative stage implicated the involvement of HuR in thymocyte maturation, selection and egress from the thymus. These mice had defects in thymocyte-positive and -negative selection, and thymic T cells lacked the ability to traffic normally from the thymus to the periphery (27). To circumvent these problems, we used a model that allowed for the deletion of HuR after T cells have undergone thymic selection, exited the thymus and become activated. In our study, using this novel knockout mouse, we demonstrate that deleting HuR in activated T cells during Th2 polarization leads to paradoxical increases in IL-2, IL-4 and IL-13 cytokine production, targets that HuR normally positively regulates. Furthermore, we show that Il2 and Il13 mRNA stabilities surprisingly increased, whereas Il4 was transcriptionally upregulated in Th2 cells from HuR conditional knockout mice. When an allergic airway inflammation model was used, HuR knockout mice mounted a robust response and displayed similar inflammation and airway hyperreponsiveness as control mice, indicating that the regulation of Th2 polarization is complex and may differ in animal models compared with cell lines. A vector was designed for homologous recombination in which the HuR gene was floxed with the insertion of loxP sites, which will result in the targeted deletion of exons 1 and 2 and a portion of the promoter region, additionally introducing a frame shift mutation upon Cre-mediated recombination. The Neo gene was used as a selection marker, and FRT sites were used to delete the Neo gene after selection was completed. An ~11.6-kb region used to construct the targeting vector was first subcloned from a positively identified C57BL/6 bacterial artificial chromosome (BAC) clone (RPCI23) by using a homologous recombination-based technique. The region was designed such that the short homology arm (SA) extends 2.4 kb to 5′ of the lox P/FRT-flanked Neo cassette. The long homology arm (LA) ends on the 3′ side of the lox P/FRT-flanked Neo cassette and is ~9.2 kb long. The single lox P site is inserted upstream of exon 1, and the lox P/FRT-flanked Neo cassette is inserted downstream of exon 1. The target region is 1.8 kb including exon 1. The targeting vector was confirmed by restriction analysis after each modification step and by sequencing using primers designed to read from the selection cassette into the 3′ end of the LA (N2) and the 5′ end of the SA (N1), or from primers that anneal to the vector sequence, P6 and T7, and read into the 5′ and 3′ ends of the BAC subclone. The BAC was subcloned into an ~2.4-kb pSP72 backbone vector containing an ampicillin selection cassette for retransformation of the construct before electroporation. A pGK-gb2 loxP/FRT-flanked neomycin cassette was inserted into the gene. The targeting construct was linearized by using NotI and electroporated into embryonic stem cells. The founder mouse was then bred with OX40-Cre, which was provided by Nigel Killeen (University of Califor, San Francisco). All mice used were on the C57BL/6 background. All animal experiments and procedures were conducted in accordance with the guidelines set forth by the University of Missouri Animal Care and Use Committee. Naive splenocytes were isolated from 6- to 8-wk-old C57BL/6 OX40-Cre HuRfl/fl knockout mice or C57BL/6 HuRfl/fl control mice. CD4+ T cells were isolated using CD4 (L3T4) MicroBeads (Miltenyi Biotec, San Diego, CA, USA) following the manufacturer’s protocol. Cells were activated with anti-CD3 and anti-CD28 (5 µg/mL each) for 5 d in T-cell media (Dulbecco’s modified Eagle medium, 10% fetal calf serum, gentamicin, Na pyruvate, L-glutamine and β-mercaptoethanol) under Th1-polarizing (20 ng/mL rIL-12 and 20 µg/mL anti-IL-4 antibody), Th2-polarizing (100 U/mL rIL-4, 50 U/mL rIL-2 and 10 µg/mL anti-IFN-γ antibody) or nonpolarizing (no cytokines and blocking Abs) conditions. Anti-CD3, anti-CD28, anti-IL-4 and anti-IFN-γ antibodies were purchased from eBioscience (San Diego, CA, USA). Cytokines were all purchased from PeproTech (Rocky Hill, NJ, USA). Tissue culture reagents were all purchased from Gibco/Life Technologies (Carlsbad, CA, USA). On d 0, 1 × 106 naive CD4+ T cells were isolated from the spleens of mice and stimulated with plate-bound anti-CD3 and anti-CD28 in one well of a 24-well plate. Cells were cultured in media containing rIL-2. On d 5 after activation, wells were harvested and cells were counted by using a hemocytometer. Cell viability was assessed via trypan blue dead cell exclusion dye. Triplicate wells were done for each group, and counting was done three independent times for each well. Experiments were repeated at least three times, and data was expressed as the mean number of total cells on d 5 from each group. For Western blotting to detect HuR and GATA-3, activated or polarized T cells were washed three times with phosphate-buffered saline (PBS) and lysed in triple-detergent radioimmunoprecipitation assay buffer, consisting of 50 mmol/L Tris-HCl (pH 8.0), 150 mmol/L NaCl, 1% Nonidet P-40, 0.5% deoxycholate, 1% sodium dodecyl sulfate (SDS), 1 mmol/L EDTA (ethylenediaminetetraacetic acid), and Complete Proteinase Inhibitor Mixture Tablets (Roche Applied Science, Indianapolis, IN, USA). Whole-cell protein lysates (100 µg) were loaded on a 12% SDS-PAGE (polyacrylamide gel electrophoresis) gel and transferred onto nitrocellulose membrane. The membrane was probed with anti-GATA-3 (1:100) (Santa Cruz Biotechnology, Santa Cruz, CA, USA) anti-HuR clone 3A2 (1 µg/mL) and reprobed with anti-β-tubulin (1 µg/mL) (Sigma-Aldrich, St. Louis, MO, USA). The secondary antibody used was a sheep anti-mouse immunoglobulin (Ig) conjugated with horseradish peroxidase (1:4,000) (GE Healthcare, Pittburgh, PA, USA). HuR and GATA-3 levels were determined by using Quantity One software (Bio-Rad, Hercules, CA, USA) after normalization to β-tubulin. Anti-HuR 3A2 hybridomas were provided by Joan Steitz (Yale School of Medicine). Anti-AUF1, anti-TTP and anti-CUGBP (anti-CUG triplet repeat, RNA binding protein 1 [Elav-like family member 1]) were provided by Gary Brewer (Rutgers University), Perry Blackshear (National Institute of Health [NIH]) and Paul Bohjanen (University of Minnesota), respectively. For detection of HuR by intracellular staining, cells were fixed and permeabilized with a Fix/Perm buffer set (BD Biosciences, San Jose, CA, USA), stained with 2 µg anti-HuR 3A2 and then incubated with phycoerythrin-conjugated anti-mouse immunoglobulin G (IgG) to detect either HA or HuR. Cells were analyzed on a FACScan flow cytometer (BD Biosciences) by using CellQuest software (BD Biosciences). Transcriptional activity was measured by using the Click-iT Nascent RNA Capture Kit (Invitrogen/Life Technologies) following the manufacturer’s protocol. Briefly, activated Th2 cells were pulse labeled with EU for 0.5 h or 1 h and harvested. RNA was extracted by using TRIzol reagent by following the manufacturer’s protocol. A total of 0.5 µg RNA was used for the click reaction. Purified nascent RNA was reverse-transcribed, and real-time PCR was performed by using SuperScript III Platinum Two-Step qRT-PCR Kit (Invitrogen/Life Technologies) and analyzed on the Step-One Real-time PCR system (Applied Biosystems/Life Technologies). On d 5, Th2-polarized cells were washed and restimulated with 50 ng/mL PMA and 500 ng/mL ionomycin for 6 h. Supernatants were collected and used for cytokine detection by using mIL-2, IL-4, IL-13 or IFN-γ enzyme-linked immunosorbent assay (ELISA) Ready-SET-Go kit (eBioscience). Experimental asthma was induced by intraperitoneal injection with 50 or 200 chicken ovalbumin (OVA) grade V (Sigma-Aldrich) and 0.5 or 2 mg aluminum hydroxide (Thermo Scientific [Thermo Fisher Scientific Inc., Waltham, MA USA]) diluted in sterile PBS (Gibco/Life Technologies) on d 0 and 7. Mice were given 1% or 2% OVA by intranasal challenge for 30 min/d on d 12–15. Mice were harvested on d 17. NF90 and AUF1 immunoprecipitation was performed as previously described. Briefly, Th2-polarized cell lysates were prepared from OX40-Cre HuRfl/fl knockout and HuRfl/fl control after 6 d of in vitro polarization. Cell lysates were prepared in NT-2 buffer (50 mmol/L Tris-HCl, pH 7.4, 150 mmol/L NaCl2, 1 mmol/L MgCl2 and 0.05% NP-40) supplemented with 1 mmol/L dithiothreitol, 0.25 U/mL RNAse out and 1 × protease inhibitor and incubated on ice for 10 min. Preclear cell lysates were obtained from supernatant of cells after high-speed centrifugation at 7,558g for 30 min at 4°C. Equal amounts of lysates were used for immunoprecipitation with NF90, AUF1 and IgG1 control. NF90, AUF1 or IgG1 were precoated onto protein A Sepharose beads and incubated with cell lysates. Protein A Sepharose beads were then washed with NT-2 buffer and incubated with 20 U RNase-free DNase I (15 min, 30°C) and further incubated in 100 NT-2 buffer containing 0.1% SDS and 0.5 mg/mL proteinase K (30 min, 55°C). The isolated RNAs were reverse-transcribed, and quantitative PCR (qPCR) was performed to measure GAPDH, IL-2, IL-4 and IL-13. Bronchoalveolar lavage was performed by instilling lungs with 1 mL sterile PBS and removing PBS. A total of 10 µL was then removed for cell count by using a hemocytometer. The remaining volume was centrifuged and supernatants were collected and stored at −20°C. Pelleted cells were resuspended in 400 µL PBS, and cytospin was performed. Wright stain was then performed to differentiate cells. Blood was collected by using retro-orbital bleeding on fully anesthetized mice. Blood was centrifuged and serum was collected and stored at −20°C. Supernatants from bronchoalveolar lavage fluid (BALF) were used for cytokine detection by using a mIL-4 or mIL-13 ELISA Ready-SET-Go kit (eBioscience). Serum (diluted 1:10) was used for IgE detection by using a BD OptEIA mouse IgE ELISA Set (BD Biosciences). Polysome analysis was performed as previously described (28). Lungs from immunized and nonimmunized mice were removed from mice and inflated with zinc-buffered formalin. Lungs were sectioned and stained with hematoxylin and eosin by using a standard procedure. Anesthetized mice were given neuromuscular blockade (0.8 mL/kg pancuronium bromide) and ventilated with a computer-controlled small animal ventilator (flexiVent, SCIREQ, Montreal, QC, Canada) with a tidal volume of 7.5 mL/kg and a positive end-expiratory pressure of 3 cm H2O. Mice were anesthetized, given a neuromuscular blockade and ventilated with a computer-controlled ventilator. Measurements of respiratory mechanics were made by the forced oscillation technique. Response to aerosolized methacholine (Sigma-Aldrich) (0),10,25 and 100 mg/mL) was determined by resistance measurements every 30 s for 3 min to ensure airway resistance had peaked. The lungs were inflated to total lung capacity after each exposure to methacholine, maintaining open airways and returning the measurements back to baseline. The resistance measurements were then averaged at each dose and graphed. The p values were calculated by using the two-tailed Student t test. To more fully investigate the impact of HuR expression on the Th2 and allergic airway inflammation phenotype, we generated a conditional knockout mouse on the C57BL/6 background by using the Cre-loxP strategy, as described in Materials and Methods and shown in Supplementary Figures S1A–D. To obviate potential interference with T-cell ontogeny, we crossed the HuRfl/fl mouse with an OX40-Cre transgenic mouse to obtain a mouse that had a deletion of either one HuR allele (OX40-Cre HuRfl/+) or both alleles (OX40-Cre HuRfl/fl) after activation. OX40 (CD134) is a tumor necrosis factor receptor primarily expressed on activated T cells upon T-cell receptor engagement but not in naive T cells. OX40 is highly expressed 24–72 h after activation (29). Thus, when OX40 is expressed during T-cell activation in OX40-Cre transgenic mice, Cre recombinase expression and subsequent genetic ablation of HuR in HuRfl/fl KO mice results. Under these conditions, only activated T cells will display decreased levels of HuR compared with controls. Therefore, most developing thymocytes will have wild-type levels of HuR, since only a small proportion of thymocytes express OX40 (30). Deletion of a single HuR allele (HuRfl/+) in activated T cells reduces HuR protein levels by ~24% (Figures 1A, B). In addition, deletion of both HuR alleles further reduced HuR protein levels by ~93% in activated T cells (Figures 1C, D). Because of the described role of HuR in regulating cell growth and proliferation, we performed counting assays to assess the proliferative capabilities of HuR-depleted T cells and found that the absence of HuR had no effect on the ability of T cells to proliferate (Figure 1E). Additionally, histological analysis of major organs and both percent and number of B and T cells were analyzed and found to be similar between the HuR knockout and control mice (data not shown). OX40-Cre HuRfl/+ and OX40-Cre HuRfl/fl knockout mice display significant decreases in HuR protein levels. (A) Western blot analysis of HuR expression (and β-tubulin as loading control) in activated T cells from OX40-Cre HuRfl/+ compared with HuRfl/+ control mice and (C) in activated T cells from OX40-Cre HuRfl/fl compared with HuRfl/fl control mice. (B) Intracellular HuR staining assessed by fluorescence-activated cell sorter analysis in activated T cells from OX40-Cre HuRfl/+ and HuRfl/+ control mice and (D) from OX40-Cre HuRfl/fl and HuRfl/fl control mice. (E) Proliferation assay reveals HuR knockout does not affect T-cell proliferation (mean ± standard error of the mean (SEM); n = 3). Western blot and intracellular HuR staining representative of n = 3. To determine timing of HuR knockout during Th2 polarization, we performed serial HuR protein analysis by Western blotting in Th2-polarized cells on d 0 (unactivated) and on d 1, 2, 3, 4 and 6, respectively. Our data showed that it takes several days to achieve a significant knockout of HuR during Th2 polarization (d 3, >50% reduction in HuR protein levels) (Supplementary Figures S3A, B). This result confirmed that, in our system, HuR can be genetically ablated and thus knocked out under Th2 polarization conditions in OX40-Cre HuRfl/fl mice. To assess the role of HuR in Th1 or Th2 polarization, we isolated naive CD4+ T cells from both heterozygous and homozygous OX40-Cre HuRfl/fl mice and respective control mice and polarized them under either Th1 or Th2 conditions. For controls, we used HuRfl/fl mice lacking the OX40-Cre transgene. Surprisingly, the effects on cytokine profiles and GATA-3 expression were different between the hetero- and homozygous models. The mRNAs encoding Th2 transcription factor GATA-3 and cytokines IL-4 and IL-13 are known HuR targets. Additionally, IL-2 plays an important role in Th2 polarization and contains putative HuR binding sites, although how it is regulated by HuR is unclear (30, 31, 32). Therefore, we decided to measure the mRNA and protein levels of GATA-3, IL-2, IL-4 and IL-13 in HuR knockout mice. Besides reduced HuR levels, Th2-polarized CD4+ T cells from heterozygous OX40-Cre HuRfl/+ knockout mice showed modest but significant reductions in steady-state levels of Gata3, Il4 and Il13 mRNAs, whereas 1ll mRNA levels in Th2-skewed cells were not affected (Figure 2A). Because we had previously shown that HuR regulates Gata-3, the signature transcription factor for Th2 differentiation, we investigated whether HuR ablation altered Gata-3 mRNA stability (21). In Figure 2B, Th2-polarized OX40-Cre HuRfl/+ T cells treated with actinomycin D, a transcriptional inhibitor, showed a small but consistent reduction (2.4 versus 1.5 h) in Gata3 mRNA stability compared with HuRfl/+ controls, similar to what has been previously observed in human systems. We performed ELISAs on supernatants from restimulated Th1- or Th2-polarized cells. Surprisingly, there were no statistically significant alterations in the IL-4 or IL-13 protein amounts secreted by Th2-polarized cells from the heterozygous OX40-Cre HuRfl/+ mice compared with HuRfl/+ control mice (Figure 2C). Additionally, IFN-γ mRNA and protein levels were unaltered in Th1-polarized CD4+ T cells from heterozygous OX40-Cre HuRfl/+ mice (Figures 2D, E). Th2-polarized cells from OX40-Cre HuRfl/+ heterozygous knockout mice display decreases in Il4, Il13 and Gata3 steady-state mRNA levels. (A) Real-time PCR analysis of Gata3, II2, II4 and II13 mRNA in Th2-polarized cells. (B) Gata3 mRNA decay as assessed by real-time PCR in OX40-Cre HuRfl/+ and HuRfl/+ T cells (n = 3 for half-life). (C) ELISA of supernatants from Th2-polarized OX40-Cre HuRfl/+ mice. (D) Realtime PCR analysis of Ifng in Th1-polarized cells from OX40-Cre HuRfl/+ compared with HuRfl/+ control mice. (E) IFN-γ ELISA of supernatants from Th1-polarized OX40-Cre HuRfl/+ mice (error bars represent mean ± SEM; n = 3; *p < 0.05). Act. D, actinomycin D; N.S., not significant. In stark contrast to the heterozygous mice, Th2-polarized CD4+ T cells from homozygous OX40-Cre HuRfl/fl knockout mice showed statistically significant increases in steady-state levels of Il4 and Il13 mRNAs, respectively, compared with the Th2-polarized cells from the control mice. Furthermore, we also observed a more dramatic (~3.5-fold) increase in Il2 mRNA (Figure 3A). Gata3 steady-state mRNA levels from Th2 cells and Ifng steady-state mRNA levels in Th1-skewed cells did not change significantly (Figures 3A, D). Surprisingly, Gata3 mRNA stability was unaltered in Th2 cells from HuR knockout mice compared with control mice (Figure 3B). To determine whether increases in Th2 cytokine mRNA correlated with protein production, we performed ELISA on supernatants from restimulated Th1- or Th2-polarized CD4+ T cells. This analysis revealed there were slightly higher levels of IL-4 and IL-13, but not of IFN-γ (Th1-skewed), in the supernatants of Th2-skewed cells from HuR knockout mice compared with control Th2 cells (Figures 3C, E). Consistent with the mRNA data, supernatants from Th2 cells from HuR knockout mice revealed a greater increase (more than twofold) in IL-2 compared with IL-4 and IL-13 (Figure 3C). We further performed kinetic studies to ascertain whether there was a temporal relationship between HuR ablation and cytokine secretion. As seen in Supplementary Figures S3C-F, there appears to be a correlation with IL-2 expression but not as much with IL-13. Th2-polarized cells from OX40-Cre HuRfl/fl homozygous knockout mice display increases in Il2, Il4 and Il13 steady-state mRNA and protein levels. Real-time PCR analysis of Gata3, Il2, Il4 and Il13 mRNA in Th2-polarized cells. (B) Gata3 mRNA decay as assessed by realtime PCR in OX40-Cre HuRfl/fl and HuRfl/fl T cells (n = 3 for half-life). (C) ELISA of supernatants from Th2-polarized OX40-Cre HuRfl/fl mice. (D) Real-time PCR analysis of Ifng in Th1-polarized cells from OX40-Cre HuRfl/f compared with HuRfl/f control mice. (E) IFN-γ ELISA of supernatants from Th1-polarized OX40-Cre HuRfl/fl mice (error bars represent mean ± SEM; n = 3; *p < 0.05). N.S., not significant. To more fully investigate the putative mechanism of altered mRNA and protein expression in the HuR knockout mice, we reasoned that the increases in steady-state Il2, Il4 and Il13 mRNA levels are most likely due to increased transcription, increased mRNA stability or both. Therefore, we performed transcriptional assays and mRNA stability assays to uncover the mechanisms by which a deletion of HuR in Th2-polarized cells increases the expression of IL-2, IL-4 and IL-13. Transcriptional assays using a nascent mRNA capture kit and real-time PCR analysis revealed a small but statistically significant increase in Il4 transcription in Th2-polarized T cells from the HuR knockout mice and no alteration in either Il2 or Il13 transcription (Figure 4A). Actinomycin D mRNA stability assays revealed an increase in the Il2 (2.5 versus 0.94 h) and the Il13 mRNA stability (1.6 versus 1.1 h) in the HuR knockout mice with no change in the Il4 mRNA stability (Figures 4B–D). Therefore, we conclude that knocking out HuR in Th2-polarized cells surprisingly increases the stabilities of Il2 and Il13 mRNAs and the transcription of Il4 by modest amounts. Il4 is transcriptionally upregulated in Th2-polarized cells from OX40-Cre HuRfl/fl homozygous knockout mice while Il13 and Il2 mRNA stabilities are increased. (A) Transcriptional assay using nascent RNA capture assay and real-time PCR analysis of Il13, Il4 and Il2 mRNA in Th2-polarized cells from OX40-Cre HuRfl/fl and HuRfl/fl mice. (B) Il2 mRNA decay as assessed by real-time PCR in OX40-Cre HuRfl/fl and HuRfl/fl T cells. (C) Il13 mRNA decay as assessed by real-time PCR in OX40-Cre HuRfl/f and HuRfl/f T cells. (D) Il4 mRNA decay as assessed by real-time PCR in OX40-Cre HuRfl/fl and HuRfl/fl T cells (error bars represent mean ± SEM; n = 3; *p < 0.05; n = 3 for half-life). To ascertain whether translational recruitment to polysomes played a role in altered cytokine protein expression, we performed experiments to determine if a HuR deletion in Th2-polarized cells had an effect on translation, specifically whether the distribution of Il2 and Il13 mRNAs was altered between the high-molecular-weight polysomes and the low-molecular-weight polysomes in Th2-polarized cells from HuR knockout mice. Recruitment to the high-molecular-weight polysomes is one potential mechanism to explain increased protein production (33). As shown in Figure 5, the absorbance profile for RNA separated by velocity sedimentation through a sucrose gradient indicates which fractions contain the low-molecular-weight and high-molecular-weight polysomes (Figure 5A). Reverse transcriptase (RT)-qPCR was performed on RNA extracted from each fraction to determine the distribution of Il2 and Il13 mRNAs. Il13 mRNA distribution was similar between HuR knockout and control mice, although there was a slight shift in the mRNA peak in the HuR knockout group (Figure 5B). However, these observations were not specific to Il13 mRNA, since there appeared to also be a similar shift in the endogenous control, Gapdh mRNA (Figures 5B, D). Il2 mRNA distribution was likewise unaffected by a knockout of HuR (Figure 5C). Taken together, we conclude that deletion of HuR in Th2-polarized cells had little effect on the translation efficiency of Il2 and Il13 mRNAs and thus this is unlikely to be a mechanism to explain increased protein production. Polysomal distribution of Il2 and Il13 mRNA is unaltered in OX40-Cre HuRfl/fl homozygous knockout mice. (A) Absorbance profile for RNA separated by velocity sedimentation through a sucrose gradient. RNA was extracted from each fraction (B), and the levels of Il13 and Il2 mRNA (C) in each fraction from each population (OX40-Cre HuRfl/fl or HuRfl/fl control) was measured by RT-qPCR. (D) The levels of Gapdh mRNA were also measured in each fraction. The data shown are representative of two independent experiments. LMWP, low-molecular-weight polysomes; HMWP, heavy-molecular-weight polysomes. The collection of trans-acting factors, such as RBPs and microRNAs, which interact with cytokine 3 UTR, is commonly called transcript milieu. Because HuR is normally a positive regulator of its targets, including IL-4 and IL-13, it was surprising to find these mRNA transcripts and proteins are increased in the absence of HuR. The unexpected results led us to speculate that perhaps knocking out HuR in Th2 cells was affecting the expression of other RBPs, since there is significant feedback and autoregulation among RBPs. Therefore, we analyzed the expression of several well-known ARE-binding proteins that are known to be regulators of mRNA stability and protein expression. By using real-time PCR and Western blotting, we analyzed the expression of AUF1, BRF1, TTP, CUGBP, TIA-1, TIA1 cytotoxic granule-associated RNA binding protein-like 1 (TIAR), KSRP and NF-90 in Th2-polarized cells from HuR knockout and control mice. We found no significant differences at the mRNA level of AUF1, BRF1, CUGBP, TIA-1, TIAR, KSRP or NF90 between knockout and control mice (Supplementary Figure S2A). Additionally, TTP, CUGBP and AUF1 protein levels were unaltered (Supplementary Figure S2B). The stark differences between heterozygous and homozygous knockout mice led us to speculate that the dosage of HuR was playing a major role in the regulation of Th2 polarization and cytokine production. A similar gene dosage effect was described in other models of single- versus double-allele gene knockouts and may involve the occurrence of indirect effects because of the loss of control of other regulatory genes targeted by the ablated gene. This phenotype was described for the cell cycle inhibitor pl7Kip1 gene. Because p27Kip1 is an important negative regulator of Th2 polarization and is also a target of HuR, we measured the levels of p27Kip1 mRNA and protein in the OX40-Cre HuRfl/fl T cells compared with control cells and found no differences in pl7Kip1 mRNA levels and a small decrease in protein by Western blot analysis (data not shown). Therefore, we concluded that HuR is not dramatically affecting p27kip1 expression. The previous experiments indicated that there were no alterations in global expression of the previously mentioned RBPs. However, distribution of other trans-acting factors that interact with 3′ UTR of mRNA transcripts can be altered when HuR is absent. We asked whether recruitment of NF90 and AUF1 was changed under reduced HuR conditions in HuR KO T cells. NF90 had previously been described to act both as a transcriptional factor and as RBPs, which stabilized Il2 mRNA. We performed RIP and measured relative amounts of mRNA, which interacted with either NF90 or AUF1. AUF1 did not appreciably bind to 1l2, Il4 or Il13 mRNAs (data not shown). NF90 did bind to Il2 mRNA equally well under wild-type or reduced HuR conditions. Surprisingly, when HuR is genetically ablated in CD4+ Th2 cells, NF90 did not bind as efficiently to the Il13 transcript (Supplementary Figure S2). There was no appreciable binding to Il4 mRNA, regardless of HuR cellular levels. Taken together, these results indicate that distribution of trans-acting factors, such as RBPs, which interact with cytokine mRNA, can dramatically change depending on ambient cellular HuR levels. Although the exact mechanism of regulation of HuR in Th2 polarization is unclear, increases in IL-2, IL-4 and IL-13 protein expression in HuR KO T cells implicated HuR in the regulation of allergic airway inflammation. Therefore, we induced allergic airway inflammation to assess the disease phenotype in HuR KO mice. Initially we chose to analyze homozygous HuRfl/fl KO mice, since Th2 cells from these animals displayed alterations in cytokine protein production, whereas the Th2 cells from heterozygous mice had no alterations in cytokine protein secretion. We used a standard chicken OVA, aluminum hydroxide (alum) model of allergic airway inflammation. To assess the asthma phenotype, we measured a variety of parameters, including number of cells and the type of cells recovered from the BALF, as well as serum IgE. As shown in Figure 6, the number of cells in the BALF from both immunized knockout and control mice was significantly greater than the number of cells recovered from the BALF of nonimmunized mice control or HuR KO animals, which validates the induction of allergic airway inflammation. However, there were no significant differences in the number of cells recovered from the BALF when comparing immunized knockout mice with immunized control mice (Figure 6A). Additionally, cell differentials indicated that ~80% of the cells recovered from the BALF were eosinophils, consistent with an OVA/alum model of asthma in C57BL/6 mice (34). However, the percent of eosinophils, neutrophils, macrophages and lymphocytes recovered from the knockout mice was similar to control mice (Figure 6B). Serum IgE levels were higher in the immunized knockout and control mice compared with nonimmunized controls and HuR KO mice. However, there were no significant differences in the serum IgE levels in immunized knockout and control mice (Figure 6C). BALF cellularity and serum IgE titers in HuR knockout mice with allergic airway inflammation. (A) Number of cells recovered from the BALF of immunized HuR knockout and control mice and nonimmunized mice. (B) Cellular composition represented as a percent of total cells recovered from the BALF from immunized HuR knockout mice and control mice. (C) Serum IgE levels as measured by ELISA from immunized HuR knockout or control mice and nonimmunized knockout mice. (D) BALF IL-4 and IL-13 levels were measured by using ELISA comparing immunized HuR knockout and control mice with nonimmunized knockout mice (mean ± SEM of n = 8 mice in each group; three independent experiments; *p < 0.05). N.S., not significant. The ex vivo polarization experiments indicated that HuR KO Th2 cells had increased production of IL-13 and to a lesser extent IL-4. Therefore, we sought to determine whether Th2 cytokine levels would be higher in the BALF from HuR knockout mice. ELISA was performed on BALF, and we found similar amounts of cytokine secretion between immunized HuR KO mice and control mice (Figure 6D). Nonimmunized HuR KO mice expressed low levels of IL-4 and IL-13. Although the results thus far indicated that HuR knockout mice have similar allergic airway inflammation as control mice, it is possible that there are differences histologically or, more importantly, there could be differences in airway hyperresponsiveness. To determine if there were histological changes in the lungs, we performed hematoxylin and eosin staining on formalin-fixed lungs from immunized HuR knockout and control mice, along with nonimmunized control mice. As expected, lungs from nonimmunized mice had no significant lesions in the lungs, whereas immunized HuR knockout and control mice displayed significant inflammation consistent with allergic airway inflammation. However, there were no discernable differences between immunized HuR knockout and control mice (Figures 7A–D). Lung histology and airway hyperresponsiveness. (A) Lungs recovered from non-immunized HuRfl/fl control mice display normal lung architecture with little inflammation, (B) Lungs from immunized HuRfl/fl control mice display significant inflammation consistent with allergic airway inflammation. (C, D) Lungs from immunized HuR knockout mice have significant lung inflammation consistent with an allergic airway inflammatory response (representative hematoxylin and eosin staining of lungs; n = 3 nonimmunized control mice, n = 5 immunized knockout, and n = 5 immunized control mice). (E) Lung airway resistance in response to methacholine exposure (mean ± SEM of n = 6 mice in each group; two independent experiments; *p < 0.05). N.S., not significant. Scale bars, left panels, 200 µm × 10; right panels; 200 µm × 100. Finally, we measured airway hyper-responsiveness in response to methacholine with the flexiVent by using invasive measurements. Both humans and mice with asthma display increases in lung resistance (the level of constriction in the lungs) in response to methacholine, although in C57BL/6 mice, the airway changes are more subtle than in other strains (34, 35, 36). As shown in Figure 7, immunized HuR knockout and control mice displayed significant increases in airway resistance compared with nonimmunized control mice at methacholine doses of 50 and 100 mg/mL. However, both knockout and control mice had similar airway hyperresponsiveness (Figure 7E). Lung elastance (elastic rigidity of the lungs), compliance (the ease with which the lungs can be extended) and Newton resistance were measured and were similar between the knockout and control mice (data not shown). Experiments were also performed on heterozygous HuRfl/+ KO mice. Similar to the homozygous knockout mice, BALF from the heterozygous mice revealed similar numbers and composition of cells as the control mice. Serum IgE levels were also unaltered in the heterozygous HuR knockout mice (Supplementary Figures S4A–C). In summary, HuR knockout mice have similar total cellular infiltration, lymphocyte and eosinophil counts in BALF. Surprisingly, HuR knockout mice had similar BALF cytokine levels of IL-4 and IL-13 along with similar serum IgE levels. In addition, despite the absence of HuR in activated T cells, knockout mice displayed robust airway and lung inflammation and hyperresponsiveness similar to that observed in control mice. These findings are consistent with our unexpected ex vivo data in that Th2 cells from HuR KO mice produce higher cytokine levels. We further investigated these results repeating the OVA challenge experiment with drastically lowered (75%) amounts of OVA, reasoning that perhaps a subtle phenotype would be masked by high antigen sensitization and challenge. We still obtained robust airway inflammation, but, as before, there were no significant differences between control and HuR KO mice (Supplementary Figures S4D–F). Together, our data suggest that mice with genetic ablation of HuR in activated T cells develop allergic airway inflammation in response to OVA challenge. The role of posttranscriptional gene regulation in controlling Th2 cytokine gene expression and allergic airway inflammation is not completely understood (37, 38, 39, 40, 41, 42, 43). HuR plays an important role in regulation of many genes involved in Th2-driven inflammatory diseases, including allergic asthma in humans (21, 22, 23). Interestingly, up to 50% of changes in mRNAs and proteins during T-cell activation occur at the posttranscriptional level (4). By using combinations of cellular and animal models, our lab and others have identified Il4 and Il13 as HuR-regulated genes (21, 22, 23). In addition, we recently demonstrated HuR binds to the Gata3 3′UTR and regulates its expression by increasing its mRNA stability (21). Furthermore, the Il2 mRNA contains AREs, and it was previously suggested that it may be regulated by HuR (21, 22, 23). Therefore, we hypothesized that HuR is coordinately regulating Th2 polarization and cytokine expression and, thus, may be playing a central role in allergic airway inflammation. 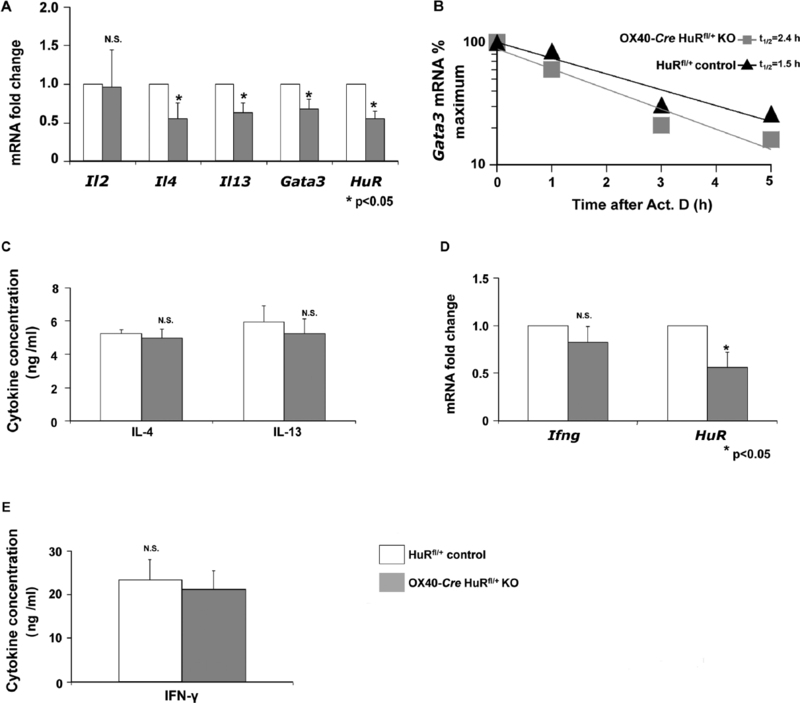 The results obtained in our murine model of conditional HuR ablation in T cells are complex, showing a gene dosage effect on Il4, Il13 and Gata3 mRNA turnover and a decoupling of the effect of HuR on mRNA metabolism from that of protein translation. In fact, a limited reduction in HuR expression (by ~26%) in CD4+ T cells from heterozygous OX40-Cre HuRfl/+ KO animals was sufficient to decrease steady-state levels of Gata3, Il4 and Il13 mRNAs, as well as modestly reducing Gata3 mRNA stability, reproducing closely the effects seen in our previous studies, but without concomitant changes in protein levels. However, whereas the changes in Il4, Il13 and Gata3 mRNA levels are statistically significant, they are nevertheless modest, which may partially explain the discordance between mRNA steady-state levels and protein expression. In the Th2-polarized cells from the homozygous OX40-Cre HuRfl/fl KO animals, the effect on Gata3 mRNA steady-state levels and stability was lost. HuRfl/fl KO Th2 cells also displayed paradoxical but modest increases in mRNA and protein of other HuR targets IL-4 and IL-13, as well as IL-2. Coupled examination of transcriptional activation and mRNA turnover for Il2, Il4 and Il13 in homozygous HuRfl/fl KO and control cells revealed that an increase in transcription was mainly responsible for the altered Il4 mRNA levels, whereas a small increase in Il13 mRNA and a greater increase in Il2 mRNA occurred in the absence of further transcriptional activation, since the Il2 and Il13 mRNAs were more stable in the HuR KO Th2 cells. Although the mechanisms of these responses are unclear, they underscore the pleiotropic role of HuR in posttranscriptional control of gene expression and suggest the potentially critical role of additional cofactors, miRNA or other RBPs in shaping HuR function. For example, under specific conditions, HuR binding to a target mRNA has been shown to lead, through association with other RBPs, to destabilization of target mRNAs (44). Furthermore, new data indicate that miRNAs regulate HuR levels and that, conversely, HuR interacts with miRNAs to conduct its regulation, adding an additional layer of complexity to the interpretation of results from our loss-of-function mouse model (45,46). Along these lines, Leung and Sharp (47,48) proposed that miR-NAs form complexes with different RBPs such as HuR in different cellular conditions to alter mRNA survival and translatability. Therefore, another possible, though yet unproven, mechanism underlying the results obtained in HuR KO Th2 cells may involve altered interactions of microRNA, and perhaps other RBPs, with Gata3 and Th2 cytokine 3 UTR. Consistent with this hypothesis, it was recently shown that HuR can repress c-myc expression by mediating miRNA let-7 binding. In the absence of HuR, let-7 cannot bind to c-myc and thus c-myc expression is increased (17). Interestingly, recent reports identified Il13 as a target of let-7 (49). Therefore, it is possible that HuR recruits miRNAs to target certain genes, and, in the absence of HuR, the miRNAs cannot bind. Overall, these data may also indicate that specific levels of HuR are critical for normal T-cell homeostasis. The surprising results of the opposite regulation of Th2 cytokines in heterozygous versus homozygous T-cell HuR-deficient mice is not the first case of an unusual gene dosage effect in animal models. A similar effect was reported after ablation of the cell cycle inhibitor p27Kip1 in a mouse model of prostate cancer and a mouse model with CFTR ablation (50, 51, 52). p27Kip1 is relevant, since this cell cycle inhibitor is a key negative regulator of Th2 polarization and T-cell proliferation, and its expression is regulated posttranscriptionally by HuR (53, 54, 55). We found no significant alterations in p27Kip1 expression in Th2 cells from HuR KO mice. More global expression profiling analysis of the single- or double-allele knockout and of control T cells will be needed to identify novel HuR-regulated genes, besides p27Kip1, which might be responsible for this phenomenon. We also explored the possibility that deletion of HuR leads to alterations in expression of other RBPs. Many RBPs contain AREs, which implicate cross-regulation between the RBPs (56). We measured mRNA levels of several RBPs, including BRF1, TTP, AUF1, CUGBP, NF90 and KSRP (9). We found no differences in the mRNA expression of any of these transcripts. Additionally, we found no difference in protein expression of CUGBP, AUF1 or TTP; however, we cannot rule out the possibility that the binding of the RBP to its target may be altered in the absence of HuR. Consistent with this idea was the finding that NF90 does not associate as efficiently with Il13 mRNA under HuR KO conditions. An earlier report showed that when HuR was overexpressed in myeloid cells, proinflammatory cytokine expression was suppressed (57). This result was a puzzling finding, since many of these cytokines are normally positively regulated by HuR. It was discovered that HuR overexpression lead to increases in TIA-1, a known translational repressor. TIA-1 suppressed the translation of many proinflammatory cytokines, including TNF-α (57). We assessed the mRNA levels of TIA-1 and its related protein, TIAR, and found no differences in expression between knockout mice and control mice. A recent report by the same group supported the notion that HuR can repress the expression of proinflammatory cytokines. By using a myeloid-specific HuR knockout mouse, the authors showed that macrophages deficient in HuR had increased expression of many cytokines, including those that are regulated by HuR. Additionally, these mice developed colitis-associated cancer, further supporting the notion that normal HuR expression is required for homeostasis (58). Taken together, both our data and data from other labs indicate that the effect of a HuR knockout in complex animal models differs from cell lines. Additionally, the data obtained with our conditional knockout mouse model suggest that HuR-dependent and -independent control mechanisms of GATA-3 and Th2 cytokines may coexist. Consistent with this idea, we have recently demonstrated that HuR can positively or negatively control expression of the same genes in breast cancer cells depending on the cellular milieu (59,60). Although the results obtained with the ex vivo polarization were surprising, they still implicate HuR as playing a role in regulating the expression of key genes involved in allergic airway inflammation. We induced allergic airway inflammation and assessed the disease phenotype. The BALF IL-4 and IL-13 levels were not significantly altered in the HuR KO mice, which could be due to several factors. About 80% of the cells infiltrating the lungs are eosinophils, which also make IL-13 (61,62). Therefore, increases in IL-13 expression in HuR-KO T cells may not contribute greatly to the overall IL-13 protein in the BALF. Reports indicate that IL-13 from both eosinophils and T cells is required for allergic airway inflammation, but the required contribution from each cell subset is unknown (63). Additionally, the recombination event that deletes HuR does not occur until after the process of polarization has begun (29,30). Therefore, it is possible that deletion of HuR earlier would have profoundly different effects. Indeed, our group has recently reported that using the identical OX40-Cre system to genetically ablate HuR does significantly impair Th17 differentiation and onset of neuroinflammation in an experimental autoimmune encephalitis model of multiple sclerosis (64). The mechanism is Il17 mRNA destabilization in HuR KO T cells. In the future, use of other models that delete HuR at different stages of CD4+ T-cell maturation will be important to determine if the timing of HuR deletion affects the phenotype. Additionally, we histologically examined the lungs from immunized mice and found that the lungs displayed inflammation consistent with allergic airway inflammation. We also measured several parameters of lung function and found that in response to methacholine, HuR KO mice displayed significant airway hyper-responsiveness. These results were replicated when we immunized mice with substantially reduced amounts of OVA. In summary, mice with conditional deletion of HuR in activated T cells develop robust allergic airway inflammation. In this study, we have uncovered a surprising and unexpected discovery whereby HuR negatively regulates the expression of IL-2, IL-4 and IL-13 in Th2 cells and in its absence leads to aberrant cytokine production. Furthermore, despite the absence of HuR in activated T cells, mice immunized and challenged with aerosolized OVA develop allergic airway inflammation, consistent with the ex vivo data, where T cells deficient in HuR do not have reductions in IL-4 or IL-13 as expected. Importantly, our results further support the notion that posttranscriptional gene regulation by HuR is complex and may be dose dependent. When HuR is removed from the cell, this alters binding of other transacting factors that affect transcript fate. Therefore, we propose that animal models of HuR deletion are critical for understanding the role of HuR in disease models, but underlying mechanisms are complex and further study is required. This work was supported by National Institutes of Health grants R01AI080870-01 and R21AI079341-01 (to U Atasoy). M Gorospe, K Abdelmohsen and JL Martindale were kindly supported by the National Institute on Aging Intramural Research Program, National Institutes of Health (NIA, IRP, NIH). Supplementary material, approximately 2.75 MB.